Start in Mabel, MN. Head North on 43 towards Rushford. You'll pass through Choice, MN (don't blink). Once in Rushford, head West on highway 16. This is the western end of the 'Historic Bluff Country Scenic Byway'. Hwy 16 will take you all the way to Lanesboro. 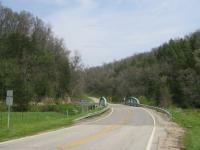 This route includes part of the "Historic Bluff Country Scenic Byway". Excellent scenery along the river between Lanesboro and Rushford. Lots of photo op stops. The entire route is full of lots of great twisties and good, fast sweepers. The road is in better than average condition. Best to do this route in the early afternoon (less chance of deer). Until you get to any of the three listed towns there isn't anything. But, Lanesboro offers excellent food and drink options. on August 3, 2009 1 out of 2 members found this review useful. I live in Rushford and the ride to Lanesboro is always a fun run. The road from Mabel to Rushford on 43 is not in that great of shape but has some fun twisties in the hills. To lanesboro from Rushford is in really good shape for Minnesota. Overall a fun ride and some good scenery.